Our second character actually showed up at the same time as another black man! Good for him! 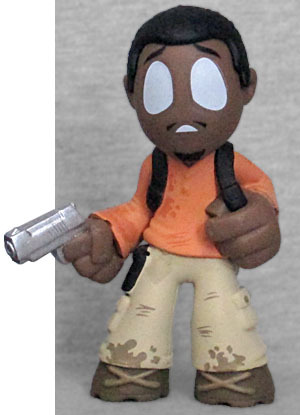 Of course, he was a weak-willed drunkard, rather than a strong and capable man, so he didn't really duplicate the role that was being filled at the time by Tyreese. In the comics he was white and in his 50s, but both versions of him were former Army medics before the outbreak. According to TV Bob, he'd been in two different groups of survivors before being invited to the prison, and both of them had been overrun by Walkers, leaving him as the sole survivor both times. It kind of gave him a complex, which is why he turned to alcohol. Bob doesn't have the most interesting outfit - cargo pants and a salmon shirt, painted with mud and dirt - but he's got a fairly interesting pose. In his right hand, he's carrying a silver pistol, held out at his side rather than aimed at anyone. 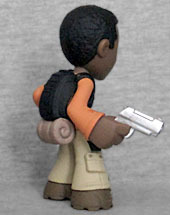 He's wearing a black backpack with a tan bedrool underneath, and his left hand is sculpted casually holding the strap, with his thumb behind and his fingers in front. His hair is short but neatly trimmed (a holdover from his military service? ), and the look painted on his face is one of fright and confusion. By starting out from a place of weakness, Bob had room to grow into an interesting character. And just when he showed signs of doing that, it was time for him to leave.